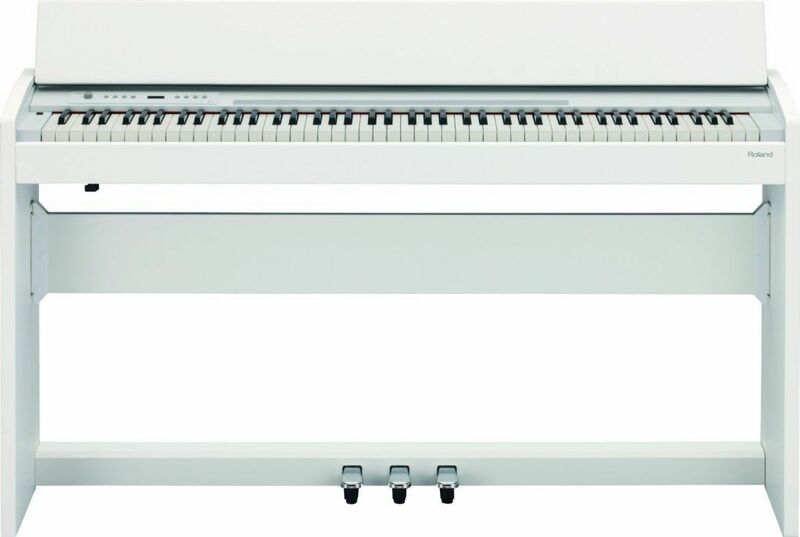 The Roland F-120 features the Ivory Feel-G weighted keyboard, giving the player genuine touch response as that found in an acoustic grand piano. The SuperNATURAL sound engine offers a tonal representation that rivals that of the real instrument. Roland is one of those reliable piano brands that really knows how to produce some of the best digital pianos on the market, and the F-120 is no exception. The Roland F-120 is an impressive digital piano that you should learn more about. The F-120 offers numerous features to allow players to improve upon their skills. The piano can be split in two for side-by-side instruction via the device’s Twin Piano mode. It can also be utilized for duet performances. The keyboard is divided into two halves covering the same octaves. Similarly, the left and right pedals can be allocated to act as damper pedals for players on both sides of the piano. Both a metronome and track recorder are built into the F-120. The keyboard on the Roland F-120 is the brand’s Ivory Feel-G with Progressive Hammer Action and Escapement. It may not be the best weighted piano keyboard, but it’s certainly worth your attention. This keyboard design utilizes the same texture, functions and esthetics as those on Roland’s standard pianos. The most advanced sensor technology combined with the device’s SuperNATURAL sound engine offer players the expression and versatility that competes with many notable pianos. Roland’s SuperNATURAL sound engine gives the F-120 a heightened level of realistic sound. The company’s engineers analyzed every aspect of the complex development of acoustic grand pianos in order to capture and reproduce the same response. This response includes the variations in tone created by differences in the velocity of each keystroke. The SuperNATURAL sound engine emphasizes three elements of performance: note decay, velocity response and key-range behavior. These elements work to produce incredibly authentic sounds that rival the response of an acoustic grand piano. The F-120 features Twin Piano mode that splits the keyboard into equal halves for personal piano instruction. The key action is reminiscent of an acoustic piano while the speakers provide a robust sound. The model’s appearance blends with any room’s color scheme as it is modern and sleek. Drawbacks to the F-120 include its stand attachment and user interface. Twin Piano Mode – Twin Piano mode splits the piano into two halves to allow as many players to use the device at once. This is useful for teacher and student practice as well as playing with two performers. Key Action – The key action for the F-120 feels very similar to an acoustic grand, making frequently switching from one to the other much easier. This also benefits users that are preparing to graduate to an acoustic exclusively. Full Sound – The F-120 gives off a realistic piano sound with strong speaker projection. Lower tones provide a full rich sound when played through the speakers. These speakers can easily fill a small or medium room without additional speaker units. The sound quality is also preserved well when listening to the audio through headphones. Aesthetics – The Roland F-120 offers a modern look with clean lines and a solid color that blends in with surrounding décor. The piano can pass as its own piece of furniture and is well suited against a clean white wall. It also features a built-in cord organizer, headphone hook, sliding cover and sheet music stand to keep materials organized. Portability – The keyboard is attached to its stand, meaning it cannot be separated and transported to rehearsals and performances. There are also no wheels to move the piano from one place to another; it is best suited as a stationary instrument. User Interface: In order to create a seamless design the piano’s panel lacks many buttons to perform functions. The drawback is that multiple buttons must be held and pressed in order to perform many functions. These button combinations may need to be memorized from the user manual. The Roland F-120 offers superb piano sound along with authentic touch. It is a suitable option for those that don’t need to carry their instrument back and forth between venues. It features everything an average pianist would need for simple tasks.